This event is now SOLD OUT! The space is at capacity and we are unable to accept walk-ins. If you did not get tickets, we hope you will instead join us for regular gallery hours, which can be found on our calendar at https://hcofpgh.org/calendar/. Opening for the first time in Pittsburgh, the traveling exhibit “Stitching History from the Holocaust” tells the heartbreaking story of a young female Jewish fashion designer who was desperate to win a visa and escape the Nazis in her native Czechoslovakia. Her attempt failed, and she was murdered; but nearly 70 years later, a brilliant decision was made to bring her dusty designs to life, and her fashion-forward clothing collection of dresses, hats, gloves and coats will be on display at the Holocaust Center in a testament to remembering all of those whose talent we lost because of hate. 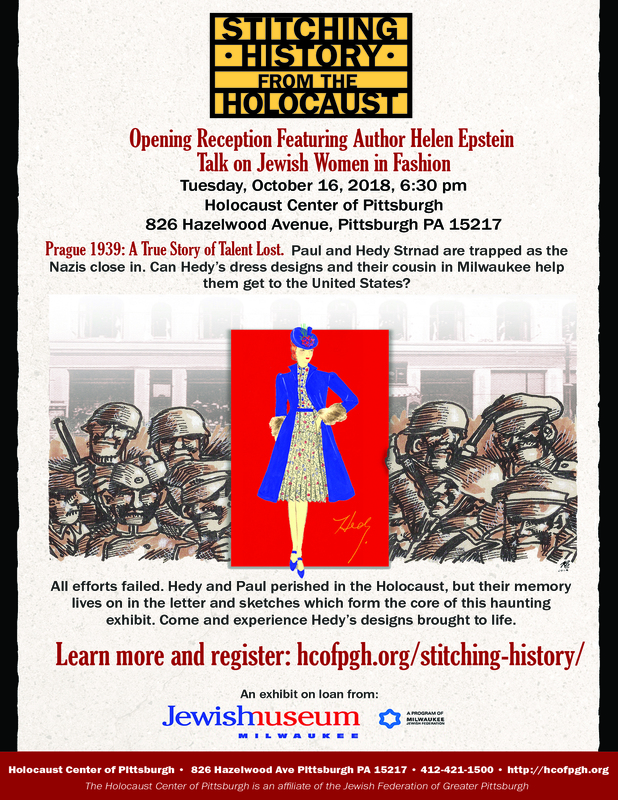 The Holocaust Center of Pittsburgh is proud to host the exhibit “Stitching History from the Holocaust”, on loan from the Jewish Museum Milwaukee. Joining us will be Helen Epstein, a journalist and author of Children of the Holocaust and Where She Came From: A Daughter’s Search for her Mother’s History, who will talk about Jewish women in the fashion industry.